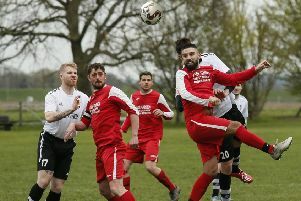 AFC Kempston needed a stoppage time leveller from Ashley Fuller to pick up a point against Holbeach United on Tuesday evening. The hosts had to make a host of changes with Alex Stoyles (injured) and Martin Conway (holiday) missing, but Kempston dominated the first period, missing some excellent chances as the visiting keeper excelled. Holbeach took the lead on 41 minutes through Jack Smith, before the Walnut Boys introduced Dom Marsala and Fuller, who added some quality as the chances kept coming. In the end, Fuller made it 1-1 with seconds left and was unlucky not to grab an even later winner as Kempston are now behind leaders Leicester Nirvana on goal difference, as both sides have seven games to go. Joint manager Jimmy Stoyles said: “To dominate a team and group of players from Holbeach FC who previously have won this league shows me, Flinny and the players how far that this group and the club have come.